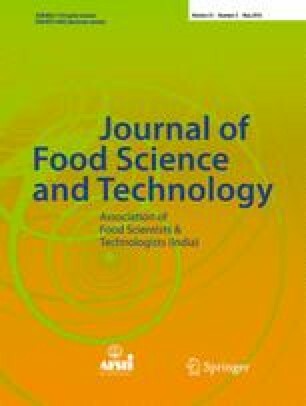 The effects of flow rate, different pressures and temperatures on cocoa butter extracted from cocoa nib using supercritical carbon dioxide (scCO2) were investigated. The yield was analyzed for total fat content, triacylglycerol (TG) profile, and fatty acid (FA) profile. Extractions were carried out at pressures of 20 and 35 MPa, temperatures of 50 and 60 °C, and CO2 flow rates of 0.5, 1, 2, 4 mL min−1. The result shows that the yield of cocoa butter extract increased with increasing pressure, temperature, and flow rate and the optimum conditions for the maximum cocoa butter extraction were 35 MPa, 60 °C and 2 mL min−1, repectively. TGs and FAs were found to be similar in composition to those of cocoa butter obtained by conventional methods. The lower molecular weight TGs and FAs showed higher selectivity compared to higher molecular weight TGs and FAs. • Triglycerides in term of fatty acids constituents. The authors would like to thank to the Ministry of Science, Technology and Environment of Malaysia for supporting financially to this research under Intensification of Research Priority Area (IRPA) Project No. 01-02-04-0512.